«©NCSX» New and factory boxed PC-Engine GT Com Cable which links up two PC-Engine GT handhelds to each other. The packaging for our remaining inventory is in shoddy shape (see photos) but the cables inside are brand new, clean, and fresh. We also located some PC-Engine GT units in our old stock but we think we're going to keep them instead of listing the units for sale. We might get nostalgic one of these days and actually want to play our collection of PC-Engine HuCARDS instead of flipping through them like baseball cards. 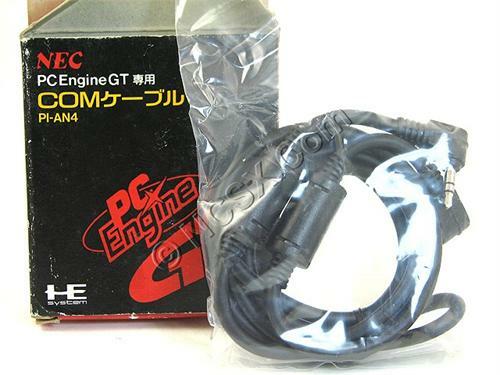 Pricing is set at US$15.90 per PC-Engine GT Com Cable. If you reside in the USA, you may select USPS Media Mail shipping on our shop which is about $2.50. International customers are encouraged to select USPS First Class Airmail at a cost of approximately US$10 to most destinations in Europe, Australia, and Asia. This document and photos are ©NCSX 1990, 2009. All rights reserved. No reproduction in whole or in part of this document may be made without express written consent of National Console Support, Inc.
Before Hori took over de-facto production of third party controllers, memory cards, and accessories in Japan, ASCII was the king of the realm.